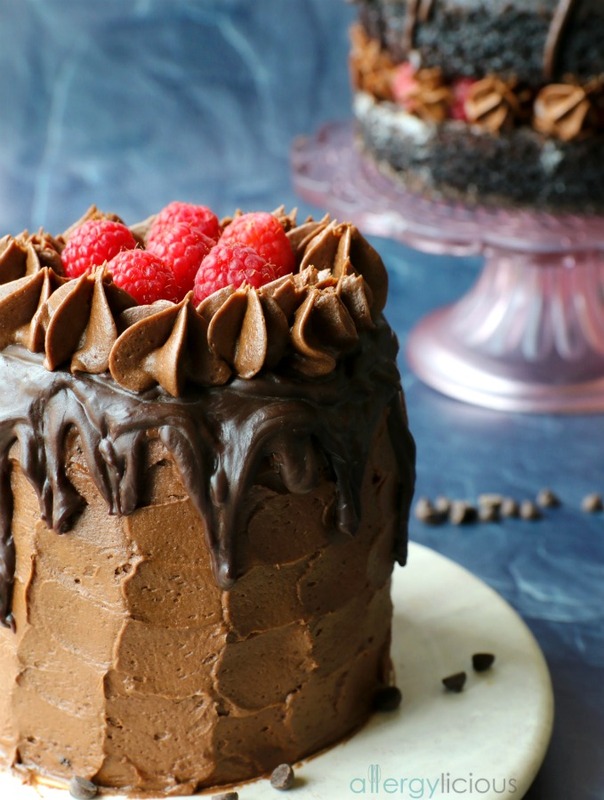 This Chocolate raspberry layer cake is delicious, vegan & allergy-friendly! It is filled with fresh raspberries, chocolate ganache and a fluffy buttercream frosting! 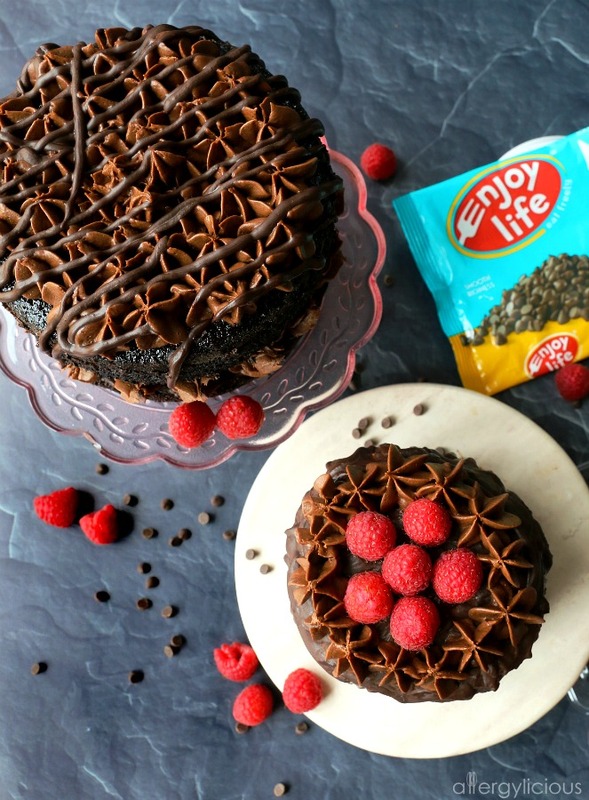 Today’s Chocolate Raspberry Cake post was sponsored in partnership with Enjoy Life Foods. Keep reading for your 15% off Code, exclusive to Allergylicious readers. Seems like there is no better way to celebrate a special event or holiday then with cake! 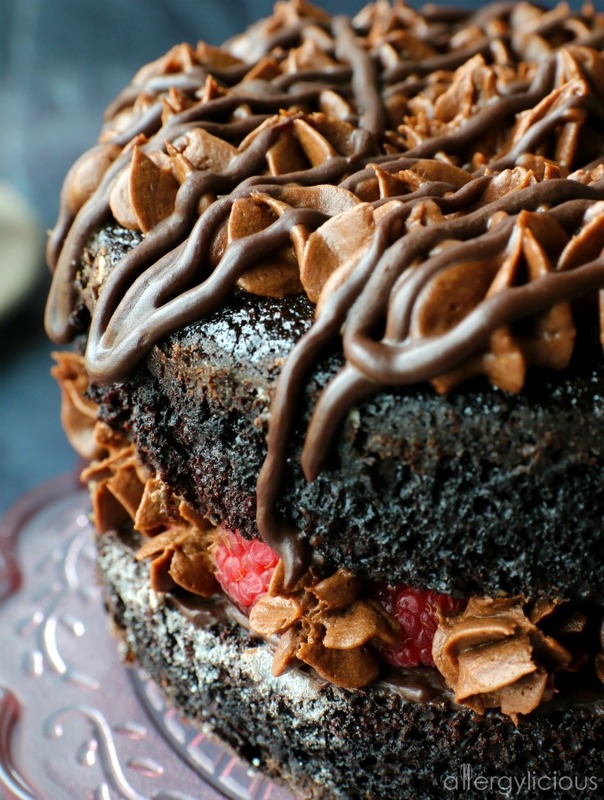 And this Chocolate Raspberry Cake is the perfect cake for such an occasion. It’s a deliciously moist chocolate cake with fluffy chocolate buttercream frosting , layered with rich and glossy chocolate ganache and a gorgeous display of berries. See, it’s the perfect cake for Valentine’s Day, a Birthday, an Anniversary or Just-Because-Kind of Day. Cakes are my favorite dessert to make and have a special place in my heart. It actually all started when I was 8 and made my first cake…it was a Pac-Man cake. Really it was just a round cake that had a slice cut out of it and then iced yellow to look like our favorite pellet-eating video game character…but to me, it was a big deal. I made my first cake! Fast forward 25 years later and my world drastically changed. At that time, our son Xander was 10 months old and just confirmed he had life threatening food allergies to dairy, eggs, peanuts and tree nuts. After the initial shock, all I could think about was that his 1st birthday was less than 2 months away and he HAD to have cake! And so, I made my first allergy-friendly cake. Everyone deserves to be able to enjoy a slice of cake, even if you live with food allergies! For me, it’s not thinking about we can’t have, but finding the beautiful, vibrant foods we can all enjoy! And with so many delicious allergy-friendly products available, it is easier than ever to create a lovely dessert that everyone to gather around and safely feast on! 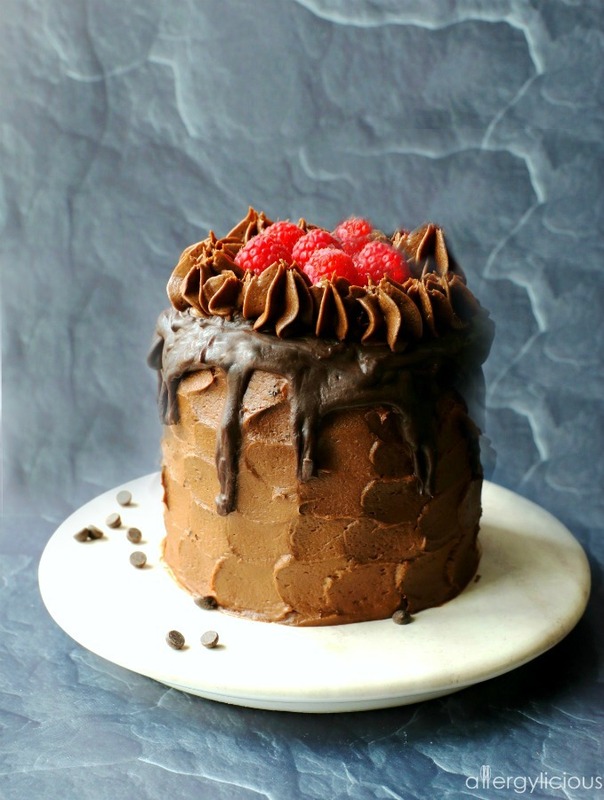 My Chocolate Raspberry Cake features a delicious allergy-friendly and vegan chocolate. 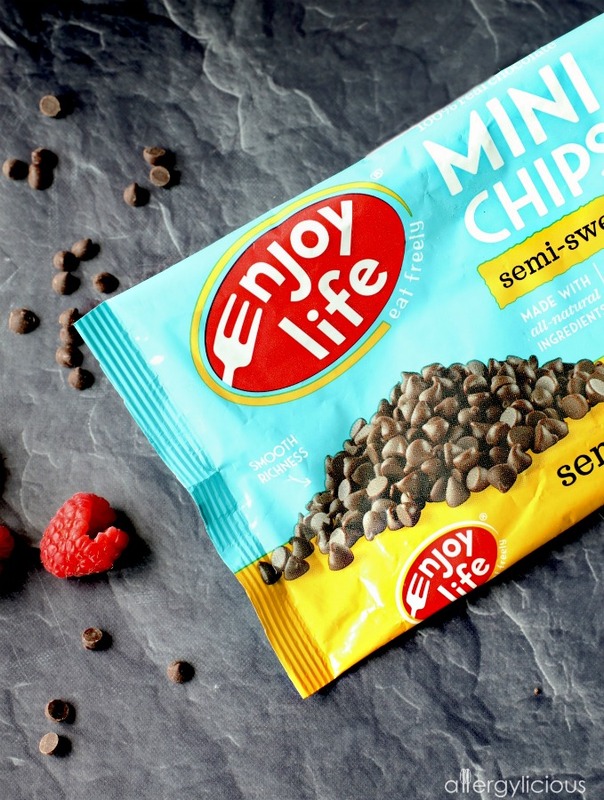 We just love Enjoy Life Foods and if I’m not watching my kids closely, they’d eat a bag of mini chocolate chips by the handful! Not that there’s anything wrong with that, but it’s even more delicious when used in a recipe. Some of our favorites and most shared chocolate recipes using Enjoy Life Foods have been German Chocolate Cake , Oreo Truffles, Chocolate Chip Cookie Dough Cups, Brookie Ice Cream Cake & 2 Ingredient Fudge . Enjoy Life’s chocolate has been a huge game-changer for us! Allergy-Friendly: Their products are free-from gluten and 14 common allergens: wheat, peanuts, tree nuts, dairy, casein, soy, egg, sesame, sulfites, lupin, mustard, fish, shellfish, and crustaceans. Non-GMO: None of the products contain GMOs. Gluten-Free: They’re delicious snacks are certified gluten-free. All Natural Ingredients: One way to eat freely is to know exactly what’s in your food which is why they are made with all-natural ingredients, like quinoa, buckwheat, and honey (sorry, not everything is vegan). One thing that this cake is NOT free from is flavor! It’s one of the most decadent chocolate desserts you’ll ever taste! It’s simply irresistible and I cannot wait for you to share it with someone you love. 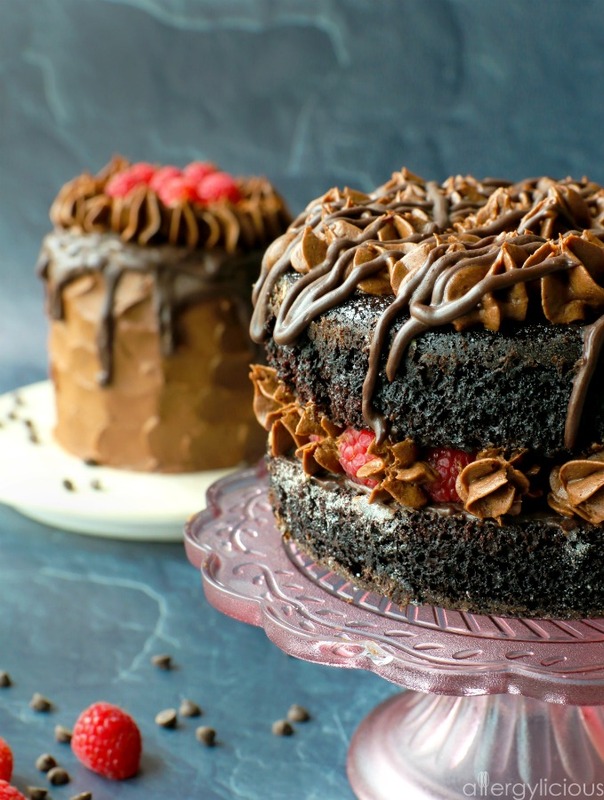 Homemade Chocolate raspberry layer cake is delicious, vegan & allergy-friendly! It is filled with fresh raspberries, chocolate ganache and a fluffy buttercream frosting! Heat oven to 350°. Grease and dust with cocoa powder two 9″inch round baking pans. Set aside. In a large bowl, sift together the sugar, flour, cocoa, baking soda, baking powder and salt. Whisk to combine. Add in egg replacer, buttermilk, coffee, oil and vanilla. Beat on medium speed approximately 2 minutes, when batter is smooth and thin. Pour evenly into prepared cake pans. In your standup mixer with paddle attachment, cream butter for 2 minutes. Sift confectioners sugar and cacao into the bowl then turn on LOW speed until the powder starts to get incorporated. Add vanilla extract, salt and creamer then turn onto MED speed for 3 minutes to get nice and fluffy. *If too thick, add 1 extra teaspoon of creamer. If too thin, add a little more sugar. In a microwave safe bowl, melt together the chocolate chips, butter and creamer for 30 seconds. Whisk together and return to microwave for another 15 seconds if not yet melted. Whisk until nice and smooth. Large Cake Option: Spread a layer of ganache on the bottom cake layer and smooth. Top with raspberries then pipe frosting in a circular pattern on top of the berries. Add your second cake layer. Pipe frosting on top to cover, then garnish with a handful of berries. Drizzle with ganache. Individual Cake Option: Remove cake from pans and lay on a smooth surface. Using a large circular cutout, press onto cake and cut out smaller circles. Should have 6-8 small cakes total. Spread a layer of ganache on the bottom cake layer and smooth. Alternate piped frosting then raspberry until entire ganache layer is covered. Add your second cake layer. Pipe frosting on top to cover, and pipe frosting onto the sides. Spread to cover cake then drizzle with ganache. Top with extra piped frosting and raspberries. 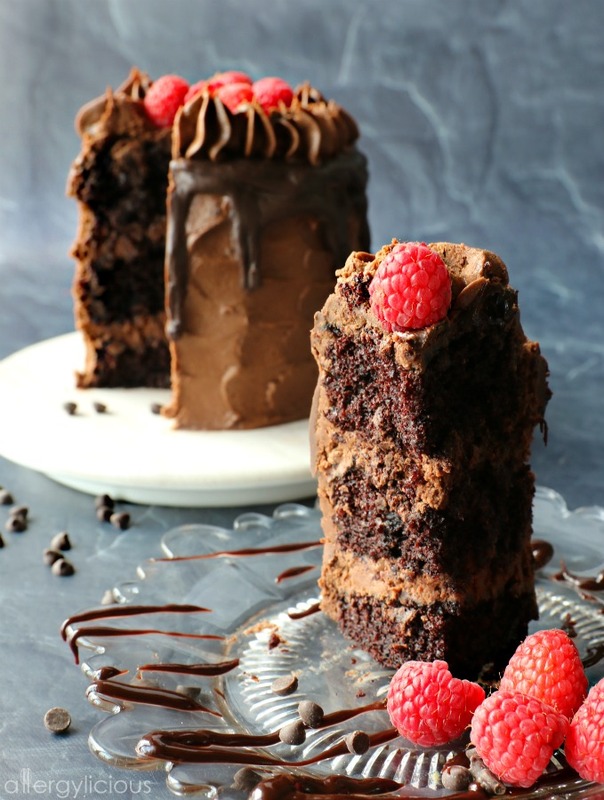 *This recipe will also make 3-4 individual Chocolate Raspberry Layered Cakes as seen above. Simply use a large cookie cutter and press into your cooked cake rounds to desired size. Decorate, layer, frost & drizzle as you normally would. **Eat cake scraps while decorating or save and use later for cake balls. Thank you to Enjoy Life Foods for making amazing chocolate products that are not only delicious but allergy-friendly. This food allergy mom appreciates it! Want to stock your pantry with baking Chocolate + Bars from Enjoy Life Foods?? Click here and use Promo CODE : CHOCOLATELOVE15 between February 1-14th for a special 15% off. Order by February 9th for a guaranteed delivery before Valentine’s Day so you can make this cake for those you love. You are just out of control with the cool baking lately Nicole! These cakes are epic! Thanks Alisa….I do have a lot of fun baking. It’s probably my favorite thing to do. Yes. Yes. YES! I love being able to prove eating with food allergies and dietary restrictions can is still be AMAZING. Waay to get your dairy free-chocolate on! Haha! Thanks Laura…..I knew you’d get it for sure. I’m always drooling over your latest recipes. 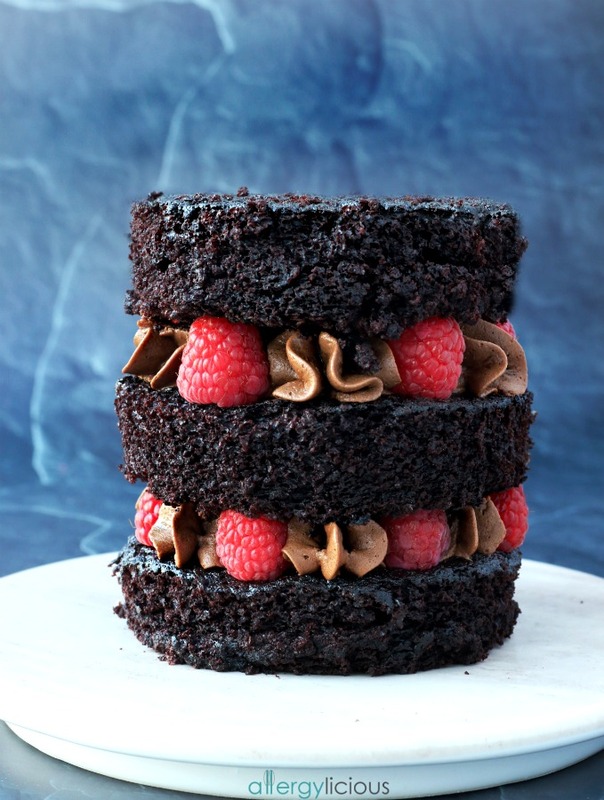 Chocolate cake with raspberries, be still my heart! And you have two of those cakes!! I’m definitely going to try this recipe. That cake looks so perfect. And I have to say, your kids and I are the same, I could eat an entire bag of Enjoy Life chocolate chips with a cup of tea. They’re so good! I LOVE CAKE TOO! This truly looks amazing. I really love the combination of raspberries and chocolate! It’s one of my favorite combos…chocolate + berries. Wow, this is the way to my heart! A rich, decadent chocolate cake! It looks so moist and so rich and dark, absolutely love it. I love the way you decorated it too! It really is so decadent but yet not overwhelmingly sweet. My family and friends keep telling me I need to make it again (for the 4th time) since it’s one of their favorites! Do you think flax or chia eggs would work here? I’d love to stick with them since I already use them for my vegan, but I don’t usually use gluten-free flour. However, this time around I have to go gluten free too! Thanks! I do think that you can easily use chia or flax eggs. I use to always make this recipe with AP Flour, before we starting changing to more GF, so you can also sub that if you choose. Actually, all my recipes are made at home with AP & GF flour to make sure the consistency is spot on. Just make sure that if a recipe calls for Xanthan gum, you can simply omit that if using regular flour. Is this cake best eaten the day it is made or ok made a day in advance? Refrigerate after making? Thanks! This is one of two desserts being made for Friendsgiving next week! You can make it the day before and it will still taste great. I like to refrigerate it and keep it covered (I have a cake cover for it). If you’re icing it completely, then it’ll be great. If you are only filling the center with berries and frosting, then I’d leave that part for the day of and just wrap the cake until ready to decorate. It’s my fav cake….I’m so glad you’re making it for Friendsgiving! Love, love, love this! Perfect for Valentine’s Day. I loved the FB post of this cake “construction birthday cake style,!” too. I may have to try my hand at that one for my son’s bday!